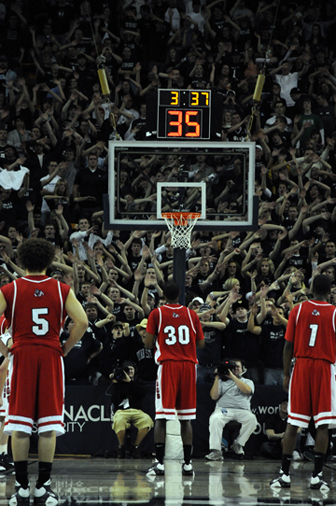 January 22, 2009 | Dee Glen Smith Spectrum. The Utah State Aggies call it home, every other college basketball team. . . well let's just say they aren't so lucky. "The Refraction," "Section F," "The Hurd," the "United Aggie Student Section," whatever it's called, one thing is certain -- no visiting team looks forward to the opponent they have to face inside the Spectrum. Thousands of fans, yelling, chanting and pointing in unison . . . oh, and the basketball team isn't bad either. After the visiting team gets introduced inside the Spectrum, just as the music quiets for the introduction of the Aggies the fans yell their greeting to the opponents: "Welcome to hell." Hell has been described in a variety of ways, none of which is very pleasant. It's been called a place of torments, a place of sorrows, a bottomless pit, a place of no rest and a place of hopelessness, suffering and unsatisfied desires. These descriptions fit all of the criteria opposing teams such as Boise State must feel when they visit USU. Aggie fans are relentless, telling players they're fat, ugly, stupid and everything in between. Normally this sort of behavior would be completely unacceptable -- a society can't continue with such vulgarity and crudeness. However, Aggie fans at the Spectrum remove themselves from normal society. On the outside most of them are friendly, God-fearing young adults but when they enter the arena they become ruthless -- like the ancient Romans entering the Coliseum, all they want to see is carnage. This season's Gossner Classic, aka The Duel in the Desert, hosted by Utah State, featured four teams competing in a three-day round-robin style tournament. The tournament also attracted well-known sportswriter Kyle Whelliston. After the tournament Whelliston wrote a detailed 1,700 word article about the Aggies. He wrote about USU's history of great shooting, long-running post-season play and of course the fans. Utah State was helped by "one of the top home-court advantages in the land and a fan base that nearly filled the Spectrum despite the university's holiday break," Whelliston reported in his article. And Whelliston was right; the Aggies are 153-12 in the Spectrum since Morrill began 10 years ago. That includes a 79-8 home record against conference opponents. USU is tied for the third longest current home winning streak in the NCAA with 28. Only Kansas with 35 and Notre Dame with 45 have won more consecutive home games. The Aggies are ranked 29th in the latest ESPN/USA Today coaches poll. With the third-longest active winning streak in the nation (12) and the second highest winning percentage this season throughout college basketball (94.4), the Aggies are looking to continue their battle toward top 25 at San Jose State on Thursday.